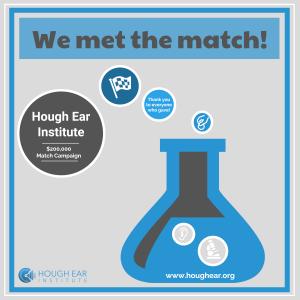 Hough Ear Institute supporters responded enthusiastically to the matching challenge issued by one of our champions. We are excited to announce that we have qualified for the entire match amount of $200,000! This campaign has been a great visual of how every dollar matters and every dollar counts. We received donations from $10 to $25,000, with an average donation of $100. That’s a lot of donations! And we are grateful. The financial support raised by our participants covers about 25% of our research budget. Curing deafness is an expensive endeavor, but there are no cures without research. We will continue to fund raise for hearing research because we believe in the vision that all who have ears will hear. Every penny collected will continue the fight to cure significant hearing loss and deafness. But really, it is much more than that. Your money gives life back to people who suffer in silence. The entire room burst into tears. It was a beautiful moment. I have never forgotten that interaction because it reminds me of why I ask people for donations every day and our researchers tirelessly work to find a cure for hearing loss. It is not research simply for the sake of knowledge. We have a powerful desire to use restored hearing to reconnect people. That is what this match does. It restores people physically, emotionally and spiritually. No dollar you give will ever be wasted at Hough Ear Institute because we want people to hear what they are missing. It is the most important goal. We are proud to have you as a partner and look forward to many more joint successes in curing hearing loss and deafness.